I have all of Isa's books, and love them, but Vegan Brunch is my least used one. I'm not sure why, I love brunch and the recipes look amazing! But I realised I haven't even done proper round up from it yet. I've posted a few bits and pieces from it which you can see here, but this is the first round up. I really need to fix that, because I have a bunch of stuff I want to make! 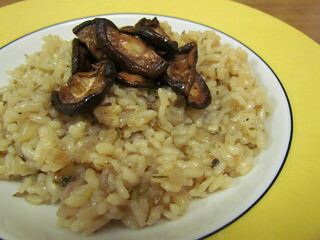 Fennel Breakfast Risotto with Smoky Shiitakes: I made this for dinner, for not brunch. I do enjoy making risotto, but I feel it is more an evening activity. Unfortunately, I found the flavour of the risotto a bit flat, plus the chopped fennel seeds gave it a weird gritty texture. 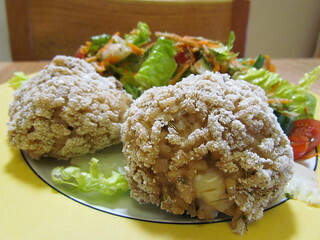 The shiitakes were a good addition, though I found to be very salty. That kind of worked with the bland flavour of the risotto. I had risotto left over, so I made cheese stuffed arancini for lunch the following day, which was actually be best thing I did with it. Grilled Marinated Asparagus Tofu Omelet: The book has a basic recipe for omelets based on silken tofu and chickpea flour, and flavoured with black salt and others. There is then a list of a whole different lot of filling variations, or you can make your own. The omelet was very easy to make, and held together and flipped well. 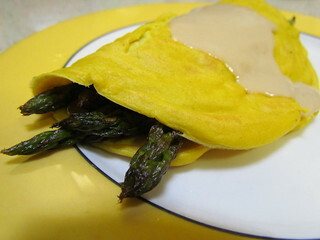 I chose the grilled marinated asparagus option, stuffed with asparagus and topped with a miso tahini sauce. It was outstanding! 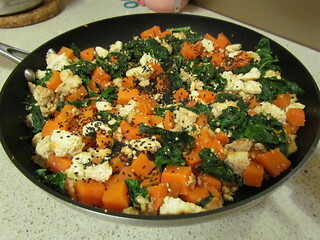 Sesame Scramble Tofu and Greens with Yams: We don't get yams, so I used sweet potato here. I chose kale as my leafy greens,and used a whole bunch chopped up and cooked down. This is quite a simple recipe, once you have baked and cooled the sweet potato, but is very satisfying. 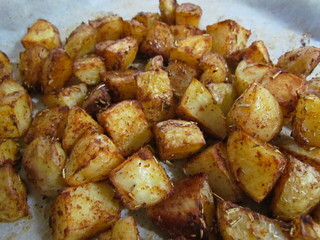 Paprika Rosemary Roasted Potatoes: Another simple recipe with a heap of flavour variations. The combination of paprica, cumin, and rosemary is outstanding! 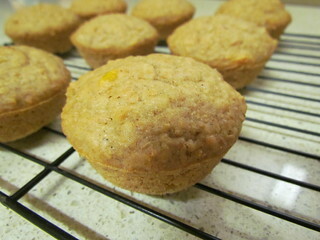 Toasted Coconut and Mango Muffins: These are a lovely not-too-sweet snack. The mango flavour comes from chopped dried mango, and the coconut is both toasted coconut shreds and some coconut extract. Do you ever look at your sweet little baby and wonder how you got so lucky to have them in your life? That is me every time I look at Dim Sim. How am I so lucky? I thought this was one of my most-used Isa books, until I scrolled and saw that I've barely made any of the things that you did here. :D Those omelettes are so great though, probably my favourite vegan eggy thing. There are a lot of recipes hidden inside there! They are my favourite omelettes that I have made. Yeah, I am normally a quick morning food prep person. Pancakes at a stretch. The omelette looks so beautiful!! This is an Isa book I've never seen at the library. I feel like I would make a lot of these things for dinner too. I wonder how I got so lucky everyday! We are lucky people indeed! I have this cookbook too and like you, I barely use it! This recipe roundup was great and I am glad that you were able to finally get to use it more. Your omelette looks amazing and the potatoes look perfectly crispy! Yum! I now just need to keep using it more. It is a miracle this omelette worked for me. Most omelette type things just totally fall apart. Some of my older vegan cookbooks talk about how yams and sweet potatoes differ, but it seems like in modern times it is just same same now. Handy for me! There is a lot of conflicting information part of it is because there is a root vegetable called a yam in Africa, but it is hard to actually get in the states. So lots of people THINK there is a big difference but nope. Your omelette looks perfect, and the spice combination for the roasted potatoes sounds great! 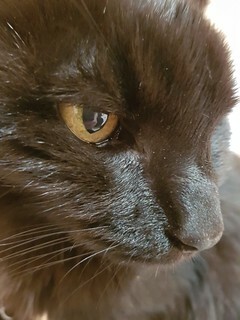 Such a beautiful photo of Dim Sim! Rosemary on roasted potatoes is basically one of the best things that can happen to either rosemary or potatoes :D The omelette looks so good too! I've made the potatoes and the muffins and a few other things. This is a book I always forget I have though! I think I might need to revisit it.